Making its first appearance today via GLBenchmark, we have the Samsung “Jasper” with model number SCH-i200 that is headed to Verizon. 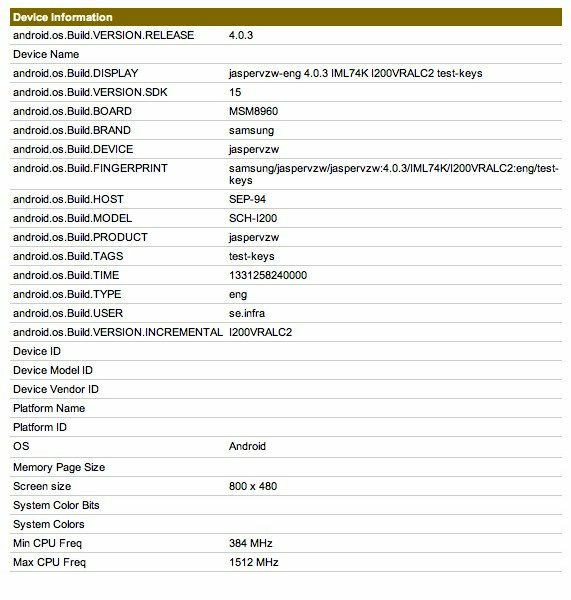 Sporting a dual-core Qualcomm Snapdragon S4 (MSM8960) processor clocked at 1.5GHz and running Ice Cream Sandwich (Android 4.0.3), this phone still appears to be more of a competitor to the LG Lucid rather than a new flagship. With a screen resolution of 800×480, this thing certainly isn’t HD. With other HD offerings on the market, something that seems to be a standard for top tier phones, we’ll keep this one on our radar but aren’t expecting it to blow any minds. I would recommend that you cross your fingers though, and pray to Buddha or whomever that this is not what Big Red decided to take over the Galaxy SIII. They couldn’t, could they?